Kurt Vile will release his sixth studio LP, B’lieve I’m Goin Down, September 25. With a new single, “Pretty Pimpin,” out today, The A.V. Club thought it would be a solid time to talk to the Philadelphia rocker about the forthcoming record, his recording process, and why he thinks “Wheelhouse,” one of the tracks off the new LP, is the best track he’s ever recorded. The A.V. Club: What makes B’Lieve I’m Goin Down different than your past records? 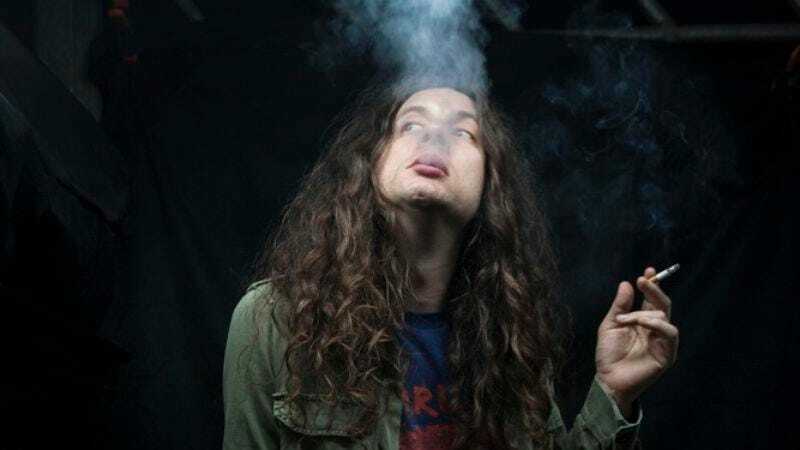 Kurt Vile: The last two records have come out two, three years apart, so just everybody naturally evolves. You know, you have different influences and different things happen in your life, blah blah blah. I mean, I guess some people like to just stick with their sound, like Weezer or something, but I think I just try to keep it as close to my real life, in a Neil Young sort of way, as possible. I feel like my music is like—there are always new influences in there. There’s more piano in this record. I’ve been into piano in the past, but I picked it back up and certain piano songwriters have really like been my favorites lately, like Randy Newman or something. Nick Cave. So there’s that. But then in another way it sounds exactly the same. It’s my voice. Hopefully I just get a little more fine-tuned and a little more real and vulnerable all the time. I think the main thing I tried to achieve on this record—which I did, and part of it was not having a producer there the whole time—was just to just be myself without being nervous because there’s a million nice mics and four assistants around waiting for me to capture that song that I wrote on my couch while I was feeling up or down. You’re almost performing it from a stage, as opposed to really living it. AVC: You recorded all over the country for B’lieve. How did that work? KV: Well, that worked fine because I’m used to it. It just gives you a different perspective. I did that on the last three records, but I guess Smoke Ring For My Halo was all East Coast, and then for Wakin [On A Pretty Day] I went over to L.A. to play with my buddy Stella [Mozgawa] on drums, and so I did that again this time. I would play with the Violators on the East Coast, and then I brought my one bandmate Rob [Laakso] with me to the West Coast and played with those guys. I’m just used to the L.A. music life. I’ve got family and familial types of friends over there, and so it was even less awkward than last time. AVC: You recorded part of the record at Rancho De La Luna, a famous recording studio in Joshua Tree. You can hear that on the record, too. There’s a dry airiness to it. KV: There are the desert tracks—“Wheelhouse” is a desert track, and there are others. I’ve got that song called “That’s Life” which was recorded in Athens, on the East Coast, but that could still be in the desert. I guess it’s more dark than light, whereas I think something about being surrounded by the desert, you never get too glass-half-empty or something. AVC: In an interview that you did with Spin earlier this year, you said that you recorded your best song ever at Rancho. Which one is that? KV: “Wheelhouse,” because it’s all live and it was brand new, and I had written it just a few days before I got to the desert. I jammed with that band Tinariwen a week before at the same studio, and so there are some Tinariwen references in there. I was easing into that world of recording with Stella and Dave [Scher]. I hadn’t seen them in a while, so I had a ton of new songs but I did get nervous at first, so I was just falling back on old songs. Finally Dave was like, “What about the new songs?” And I was like, “I’ve got this one, I don’t know how it is…” And then we just did it live. We actually got it on film, too, so one day the world can see it. But it was just this thing that happened. We just did two takes and it was just the realest—you know, the whole time I was freaking out while I was doing it, I was thinking it was all a wash, and then we heard it back, and… yeah. AVC: You’ve also said in interviews that you think the record has a nighttime vibe. What do you think makes this record a night record? KV: The literal reason is because it was recorded at night. The best hours were somewhere between 11 and 5 a.m. That was when all the best stuff happened. And then you stay up later and later and you get up later and later, but that’s the way I’ve always written songs anyway—I’ve always been pretty nocturnal. But the vibe of the songs is a night vibe. They were probably all written at night mostly, and then we recorded them at night. And we were well oiled. [Laughs.] We did all kinds of things to keep going. AVC: Can you explain the title? KV: It’s like, “Believe I’m going down…” The whole “believe” thing is a very, very blues delivery thing, and “going down” can be like mortality, like you’re going down, or you’re feeling down. Or like [with] Danny Whitten, “Come On Baby, Let’s Go Downtown,” it could be an opiate reference. It’s wide open. Mainly it’s a blues and folk thing. Townes Van Zandt, he talks like that—you know the song “Prodigal Son,” which the Rolling Stones cover, it’s like “Believe I’ll ride / Believe I’ll go back home”? I’ve been keeping a journal, at least a digital one, and I think I just added, “believe I’m going down” to a song. Sometimes I forget where I add it . I have a song on the album that’s called “All In A Day’s Work,” and in the refrain, I go into this picking pattern and when I was recording that I started saying, “Believe I’m going down” in this kind of melodic way, and then we recorded a refrain of that, and I just sang it over and over again. It’s really awesome and melodic but it was just one too many songs, so it’s going to be on the deluxe version. So it’s kind of cool, like Led Zeppelin “Houses Of The Holy”—which is not my reference, it’s my bandmate Rob’s reference—but you know it’s like when you have the title track on a song that’s not on the album. It’s going to be on the deluxe version. It really belongs on the end of the record but it just made the record a little too long. AVC: Is it hard to name a record? KV: I think ultimately it comes to you, but this one was a slow process. I had a bunch of joke titles, which was a good hobby for a while. A lot of times I’m pretty paranoid, or at least lately and on the last two records. I’ve gotten a lot more paranoid in my older age. People ask me the album title, like, “What are you calling it?” I’m like, “It feels dumb to say it out loud, just wait until you read it.” It almost feels like you’re taking yourself too seriously, which I take myself seriously plenty, but if you just tell somebody your album title all loud and proud it’s almost like you fancy yourself a poet and then I feel like if you really were one you wouldn’t say it out loud. Once you hear the record it’ll make sense, but before then, what does it even mean? Also, because there are a million albums, there’s always got to be a title or it’s untitled, so in a way it’s pretty bogus in general unless it can make sense with the record that you’re hearing. Everybody’s got to have a title so how many bogus titles are out there in the world every day? Probably a lot. Probably a lot of bullshitting, really. Just bullshitting. Self-importance. AVC: And if you tell someone the title, what response are they going to give you? They’re going to have to say “great,” and that’s disingenuous. KV: That’s the other thing, because then you have to explain it. With Wakin On A Pretty Day, it’s long and it’s pronounced a certain way and it’s spelled a certain way and I’m just going to get another question after that. “Oh, it’s called B’lieve I’m Goin Down.” “Oh, cool, what’s that?” It’s like you’ve got to explain everything. It’s never just a one-word answer. AVC: Does that paranoia trickle into your music-making? Do you worry about if fans are going to like your songs? KV: I’ll know when a song’s really awesome, for sure, and I get super stoked and I’m so high when I’m hearing it back, but then you sit with the record forever. You’re mixing it and you can really just over-think everything. I’ll go back and forth all the time. There’s downtime in music, which obviously is necessary or else you’d lose your mind in other ways, but if we’re on tour and there’s electricity from the audience, if you’re getting a good response, then that’s the positive side of the mojo where I could feel cocky and just know I’m doing good and then there’s a time all of a sudden when you’re alone and you just don’t know if people will like it. I mean, I know the record’s real good but I know that there are definitely things I would’ve changed at the end of the day. I work on things forever, and there are things I wish I didn’t do, but ultimately I know the record is good. I kind of let go of big expectations, maybe because hopefully that means if I don’t have them, that it’ll do really well, but you just never know. AVC: You just do what you want and you do the best thing you want to do. KV: Ultimately I’m going to succeed somehow. B’lieve I’m Goin Down is available for pre-order now through Matador Records, iTunes, Amazon, and other fine online merchants.